Truth is in cinemas December 3 2015. On the morning of September 9, 2004, veteran CBS News producer MARY MAPES (Cate Blanchett) believed she had every reason to feel proud of a broadcast journalism job well done. By the end of the day, Mapes, CBS News, and the venerable CBS News anchor DAN RATHER (Robert Redford) would be under harsh scrutiny. The evening before, 60 Minutes II had aired an investigative report, produced by Mapes and reported on-air by Rather, that purported to reveal new evidence proving that President George W. Bush had possibly shirked his duty during his service as a Texas Air National Guard pilot from 1968 to 1974. The piece asserted that George W. Bush had not only exploited family connections and political privilege to avoid the Vietnam War by joining the Texas Air National Guard, but he had failed for many months to fulfill his most basic Guard obligation-showing up on base. Mapes and her team of researchers had scrambled under a tight deadline to pull together both on- air eyewitness testimony and newly-disclosed documents to make their case, and they felt confident that their story was solid. In the lead-up to the 2004 Bush v. Kerry presidential election, the "Bush-Guard" story could have had profound ramifications. But within days after the story broke, George W. Bush's military service record was no longer the focus of media and public scrutiny. Instead, it was 60 Minutes, Mapes, and Rather who were under question: the documents supporting their investigation were denounced as forgeries, and the 60 Minutes staff was accused of shoddy journalism or, perhaps worse, accused of being duped. Eventually, Mapes would lose her job and reputation. Dan Rather would step down prematurely as CBS News anchor. How did attention end up focused on the journalists who questioned the official version of the story? How did the minutiae of document typefaces, line breaks, and superscripts become seemingly more important to the national discourse than the question of whether the President had failed to fulfill his military obligations? Have journalistic integrity and independence been fundamentally altered in today's newsrooms and boardrooms? 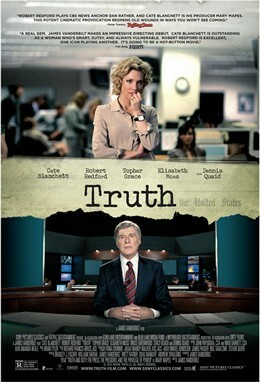 TRUTH is based on Mary Mapes' memoir Truth and Duty: The Press, the President, and the Privilege of Power (2005, St. Martin's Press). Kung Fu Panda 3 - UK Release Date Announced!